iPhone, Blackberry or Android, whatever you use, here are some useful mobile apps you can use to backup and sync files online while on the move. These are cool apps that let you store, sync and share files online and make them accessible from almost anywhere. Files saved on one computer can be accessed from all your laptops, desktops and smartphones. How Backup and Sync Software Works? If you haven’t used these apps before, this is how it generally works – the application’s folder sits on your desktop and you can upload files to this folder. And when you are connected to the internet, the files are synchronized between all the computers and mobile devices where you have installed the app. Different computers may be running different versions of Windows, Mac or Linux. Most leading mobile devices like iPhone, iPad, Android, Blackberry are generally supported. With Dropbox, you can access your files from anywhere. In addition, it supports real-time upload of changes. That is, whenever you change a file on your phone, PC or mac, it will automatically be reflected on other devices in real time. You can sync and share folders between people. All files are accessible from web browser. Dropbox comes with 2GB of free storage. Dropbox supports Windows, Mac OSX, Linux. It also has APIs for Mobile. Ready to download apps are available for iPad, iPhone, Blackberry, and Android. If you are looking for a free solution for your small business, this app is a clear winner. SugarSync supports almost all features of Dropbox like backup and sync, remote file access, versioning. In addition, it allows you to upload/sync via email, allows simple file editing over the internet. There is no limit on file size. You can set permissions and password protect the shared folders. 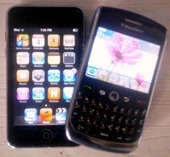 In addition to iPhone, Blackberry and Android, SugarSync also supports Symbian and Windows Mobile. It supports Mac and Windows only. Linux option is not available. Other options to consider are MobileMe (supports iPad and iPhone only), Box.net, and Carbonite. Such apps can generally backup and sync files of almost any file format. Be it Word, Excel, Powerpoint, Images, PDFs, Web pages, Text files, or Business cards. You can stream movies and music directly from the apps. So whether you use them to backup and sync for business purposes or for your personal use, these apps greatly simplify your life. Keep providing such information.This is really useful to know how syncing option works in your pc and mobile.